Saturday, July 29, 2017 • 11:00am - 1:00pm. Louis Frank Frick, age 59, passed away Thursday night, June 29, 2017. In his youth he was an avid surfer and consummate jokester and, although he broke his neck in a car accident at age 19, he carried that playful attitude and indomitable spirit through his life. 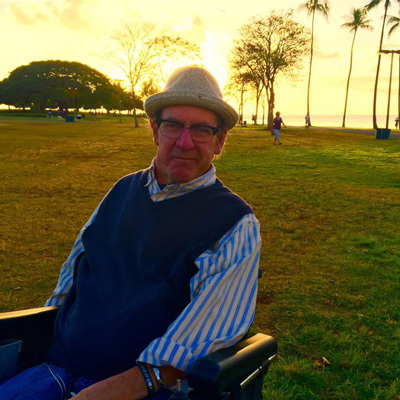 Louis was passionate in his drive to improve the lives of people with disabilities. He worked at Access to Independence, San Diego's Independent Living Center for people with disabilities for 23 years, the last 17 as Executive Director. During his time at Access to Independence, he led and took part in projects, such as providing disability awareness training to over 350 volunteers for Super Bowl XXXVII, was part of the design team for Petco Park ensuring accessibility for the entire community. He chaired the Mayor's Committee on Disability from 2009-2015 and served on the National Council on Independent Living for 5 years. Louis served as a role model in many ways, including his pursuit of higher education. He completed the Bachelor of Vocational Education and the Master of Science in Rehabilitation Counseling through San Diego State University. Louis continued to support the academic growth of students at SDSU by giving guest lectures, mentoring interns, hiring graduates and working part-time for the Interwork Institute at SDSU. He also co-chaired the SDSU committee, Enhancing Campus Climate and Culture for Persons with Varying Abilities, to support efforts for improving accessibility and inclusion. While these larger projects were important to him, working with individuals took center stage in his heart. He helped nearly 500 persons with disabilities transition from nursing home back into the community. His mother Diane Davinroy Frick and his father Louis George Frick predeceased Louis. His wife Kristine Limont, his brother Stephen Frick, his nephews Christopher Frick and Brandon Frick and his sister-in-law Magali Frick survive him. Louis is also survived by his cousin-in-law Carol McIntire who graciously allowed he and his wife to co-parent her two children, Stephen Froedge and Stacy Condie, who now both have families of their own: Stephen's partner Nadia Hoppe and their daughter Livia; and Stacy's husband Tim Condie and their two daughters, Cora Mae and Sophia Grace.